You can harvest rosehips from late summer through early Winter. Look for the bright red, oval-shaped hips of the wild dog rose. The fresh hips are surprisingly high in Vitamin C – much of which is lost in the drying process. Try making this rosehip infused apple cider vinegar for a tasty way to keep colds and flu at bay. You will need a Kilner jar or jar with an airtight lid. Gather enough rosehips to fill ½ of your jar. Top and tail the hips, then rinse well in a colander. Cover and leave to dry. 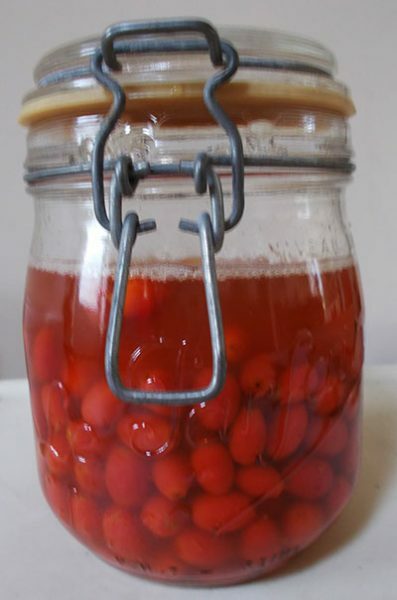 Use a sharp knife to cut a small slit in the side of each hip before putting it into the kilner jar, this is to release more of the goodness from the hips. Cover with apple cider vinegar and close the lid. The hips should be fully covered leaving enough space for to give it all a good shake. I usually leave a third to a quarter space. Leave in a sunny window for 3 – 4 weeks. Shake regularly. Then strain and bottle. 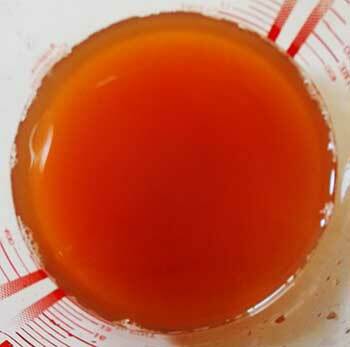 The vinegar will have taken on a lovely warm red colour. Rosehips have 20 – 40 times more Vitamin C than oranges, plus Vitamins A, B and K.¹ Use rosehip vinegar in salad dressings. For a sore throat add warm water to a tablespoon of vinegar, gargle and swallow. To keep colds at bay mix a ½ – 1 teaspoon of cayenne pepper with a teaspoon of wild rosehip vinegar, add room temperature filtered water, stir and drink. Consume 1 – 3 times a day. CAUTION: Do not eat the fresh rosehips, the seeds within have been likened to very fine fibre-glass and can your irritate your throat and digestive tract. (1) Bruton-Seal J., Seal M. Hedgerow Medicine.